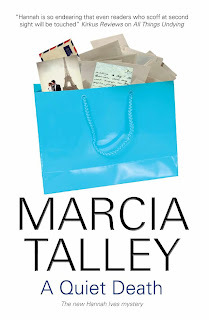 Today Jungle Red talks with Marcia Talley, Agatha and Anthony award-winning author of the Hannah Ives mystery series and more than a dozen short stories, and the 2010 President of Sisters-in-Crime, about SinC's look at the future of publishing. authors who want to succeed in this new world had better get savvy, quickly. DEB: Marcia, can you give us your impressions of the companies you visited? One of the things I found most reassuring was that all these people seem to really LOVE books. 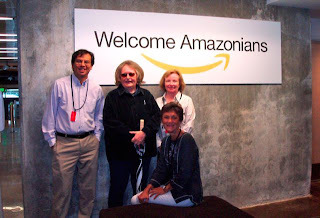 The thing that impressed me the most was that almost without exception, the individuals who are running the e-book operations at Amazon, Google and Apple came from the world of New York publishing. They understand the business inside and out. But unlike New York publishers – that are paralyzed by towering levels of bureaucracy and but-we’ve-always-done-it-this-way attitudes – these folks are not afraid to smash old paradigms and take risks. Each of these companies has more than 20,000 employees, yet they operate as “little villages” where individuals are allowed to make decisions, collaborate with colleagues in other areas and gather feedback. They’re also characterized by charismatic founding leaders who are still very much part of the day-to-day operations of the companies. Secondly, Amazon, Google, Apple and Smashwords are all committed to selling books. OMG, what a concept! “Every book ever printed, in any way, all available in less than 60 seconds anywhere in the world,” says Amazon. Apple wants to offer iBooks wherever in the world users have access to iTunes. Google’s vision is for people to have whatever they might want to read through what Google terms “books in the cloud,” aiming, like Smashwords, at the enormous global Internet market – 1.8 billion users and counting. which we made available to our members in August but has just been released for wider distribution. DEB: Will people continue to read "paper" books? I was intrigued by the "bundling" concept. example, a customer may go to the website of Powell’s Books in Portland, OR and order the “bundle” for a new book. While Powell’s delivers the physical book, Google would be the delivery mechanism for the e-book portion of that order. This is in the works now. DEB: What about royalties? At present, authors are taking a big loss on ebook royalties. Will that change? "Resistance, in the long run," the Author's Guild notes, "will be futile. As the e-book market continues to grow, competitive pressures will almost certainly force publishers to share e-book proceeds fairly. Authors with clout simply won’t put up with junior partner status in an increasingly important market." Indeed, I've heard some authors with major houses question why they even need a NY publisher. If an author can put a book up on Kindle and get 70% of the profits, or on Smashwords and get close to 85% ... it’s kind of a no-brainer. An author getting less than 25% under her current contract is going to start taking a hard look at exactly what her publisher is putting on the table. DEB: Will bookstores survive the revolution? IndieBound (formerly BookSense) platform. This would allow independent bookstores to sell e-books to their customers. DEB: Will electronic publishing give authors more control over their work? MARCIA: I would like to think so! There’s that embarrassing sailing boo-boo in Sing It To Her Bones that I’d like to correct, for example. Certainly with Smashwords the author has total control; she can change the text multiple times, change covers, change the price, all at no cost. And with an e-book, the reader, too, can control his reading experience: font size, spacing, being able to click from the table of contents to a particular chapter, or even view a behind-the-scenes author interview. Sobering thought. I write in my pajamas. DEB: Marcia, you have a new book coming out, A QUIET DEATH. Will it be available as an ebook? I’m glad you asked about A Quiet Death, though. It was inspired by an article I read in the London Times a couple of years ago where a bus got to the end of the line and the cleaning people discovered a shopping bag full of old love letters and photographs. I moved the plot to Maryland. Hannah is returning from a charity luncheon in Washington, DC, when her train is involved in a horrific crash. Although injured, Hannah remains at the side of her seatmate, reassuring the critically injured man until emergency workers free him from the twisted wreckage. Nursing a broken arm, Hannah is discharged from the hospital with her ‘belongings,’ including a distinctive shopping bag she last saw in the hands of the stranger on the train. Hannah’s attempt to reunite the bag with its owner unwittingly sets in motion a chain of events that could put her own life in danger. Unintimidated, her search gradually narrows to a remote cottage on Maryland’s eastern shore, where Hannah discovers how fine a line there is between love and hate, forgiveness and betrayal, and how easy it is to cross over that line to murder. DEB: Marcia, thanks so much for sharing. The next few years are going to be very interesting for publishing, but I think people are going to keep reading, and that there will always be a place for good books. Speaking of which, congratulations on A Quiet Death (I've read it--it's fabulous!) and I can't wait to have a real copy--and one on my e-reader. What about you, readers? Will you embrace both? 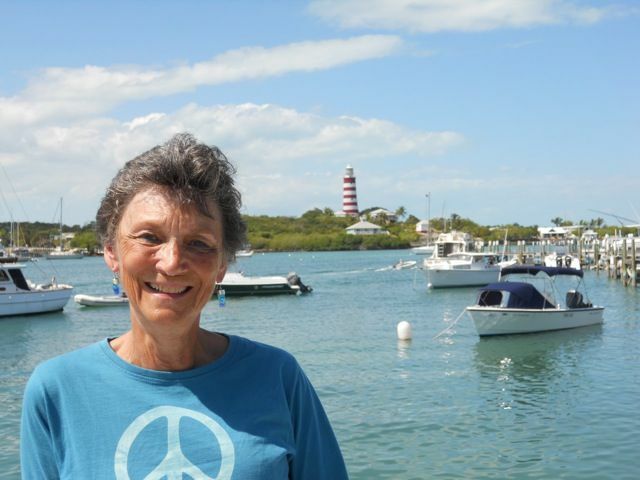 Welcome to JRW Marcia--I'm going to picture you writing in your pajamas in a hammock from now on! I have to say this whole set of changes boggles my mind. I still don't own an e-reader--clinging stubbornly to my books! As is usual for me, I'll wait until the wave knocks me over and then start to paddle:). Sisters in Crime did a great job with the summit last year--truly cutting edge stuff. Thanks for bringing Marcia in today Deb! After much deliberation I finally sprung for the NookColor, just last night. The person who helped me decide on accessories turned out to be the general manager of the Barnes & Noble I chose to visit yesterday. He told me that B&N, despite buying and absorbing another chain in the last year or two, is completely debt-free. That's pretty huge, especially in light of the Borders debacle. Borders made tons of bad business decisions, mostly from trying to grow too fast. B&N was an early Web adapter, and keeping their books trimmed has helped them further survive the economic turns. Having Starbucks kiosks in every store doesn't hurt, either. So don't count them out just yet. Just like everyone else who will stopping by here today, I dearly love books. After spending a pretty long time staunchly declaring "No Ereader for this gal!" I ate my words and am now involved in a very lovely relationship with an iPad. I've downloaded iBooks, Kindle and Nook apps onto it and am no longer firmly in the "Real Books Only" camp. I think "Tree Books" and "Ebooks" can complement one another, and both have found their place in my life. One example is, of course, out of print books. For those who never had a chance to read Margaret Maron's Sigrid Harald series - that will now be possible in the electronic version. A great thing! And new to me authors that I "think" I'd like to try, but don't want to put out a lot of money for a hardback OR (and this has become a major concern at my house) continue finding shelf space for authors I'm not really familiar with. The electronic version is a life saver. Do I still buy "real" books?? Oh my - yes. And still, way too many. There's always going to be a long list of "auto-buy" authors in that category. And I treasure every one of them. Another thing - Ereaders are just plain fun. I, like Roberta, still haven't made the e-reader plunge. I do enough reading on the computer all day and I like to give my eyes a break. But I can see that one will probably be in my future. I hate running out of books on trips (and hauling a heavy suitcase everywhere). I love the idea of bundling. I think about that all the time, actually...how convenient and perfect that would be. Last night, J and I were talking about an upcoming trip. He mentioned tow books he'd like to read--I had my Kindle right there, and plink, plink, instantly they were there for him. We had a real moment of realization--if that's gonna be how books are delivered, that's pretty fabulous. We all have to learn how to embrace it--making sure authors get what they deserve financially--not fight it. I still read and buy book-books. (Like Kaye, WAY too many.) But my Kindle and my iPad are fantastic. Oh, Meredith-- does this <> mean a hug? I'm waiting for renegotiation of percentages writers receive for e-books. My last Georgie book sold really well on Kindle (reached number 77) and was thus outselling the hardover that came out the same day. Maybe there should be a month's delay before the e-book comes out to allow the hardcover to make its mark--or maybe they should include e-books for the NYT list! They do, Rhys! The new NYT list includes ebooks--and it is INCREDIBLY fascinating. Wow, this is a terrific and much needed interview. It is so great to hear something positive obout our industry and its changes rather than just the teeth gnashing over change. Many thanks to both Marcia and Deb. Or is it Debs??? typo? A mystery to be solved? Hi, all. Just arrived in Deerfield Beach FL for SleuthFest. Thanks for all the good comments. After I have a sandwich I'll be back! Great blog, Marcia, thanks! I have always said NEVER, ever, ever, to an electronic reader. I look on them with the same disdain I reserve for cell phone users who insist on sharing their personal lives with me. Richard and I adore/devour books. We long ago ran out of space for them. Yes, they're piled on the floor. And though I promised I would buy only books of my passion, academic mysteries, they mysteriously appear in great numbers. So last night all of that changed! Sandra Balzo emailed me that books from her Wisconsin coffeehouse mystery series were going Kindle. I just discovered Sandra's books and I love to read mysteries set in my state. My resolve to be one of the last book people, walking the woods and passing stories down to the next person (ala Fahrenheit 451) crumpled. My Kindle is winging its way here. So I can catch up on Sandra's books and many others, too. Welcome Marcia - I've been reading the reports about this trip you all took. Fascinating to hear you talk about it. Such a good reminder, that these are business people who LOVE books just like we do. I do hope authors get their fair share of ebook profits. Yay, Authors Guild and Sisters in Crime that are informing us and raising the volume. I got my Sony Pocket e-reader for Christmas, but I was already downloading and reading on my laptop because 1)I was finding there were books I wanted to read that were only in ebook version and 2) I was seduced by the same instant gratification Hank describes. As a reader, I flat-out love ebooks. 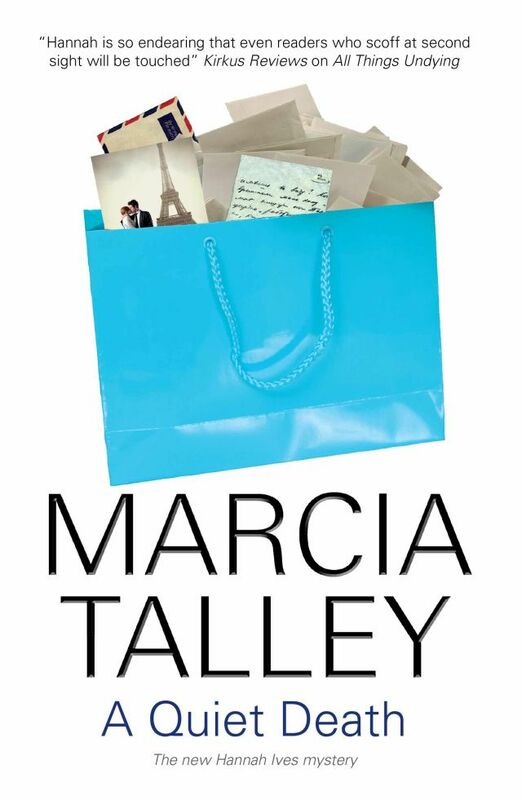 As an author, I agree with Marcia--there's going to be a real shakedown period as the publishing business figures out how to integrate 21st century technology into a 19th century industry. But I have great faith that the ultimate outcome will still leave us with readers, writers, editors and booksellers. Hi, Marcia! Thanks for this fascinating glimpse into what the big boys are thinking/doing about ebooks. I've been anxiously waiting for your works to come out in ebook ever since I met you in Bolingbrook, IL last year (I'm the one who made you sign my netbook, *grin*). Since then I've changed devices to a a Sony 950 and then Saturday I succumbed to an iPad. (LOL and yep, both of those are autographable!) Ever since I lost a two generation collection of books due to a divorce and a move, I've been staunchly ebook. My pet peeve is not being able to find terrific authors such as yourself, Denise Swanson, and Laura Childs in ebook. I wish publishers would catch up already. Thanks for all the nice comments, everyone. I found the SinC report, and Marcia's take on their research, reassuring. And I'm going to join the revolution. Last night my new Android phone arrived, so I'll be downloading something to read . . . Oh, choices, choices. Hello from SleuthFest whew I'm just back from dinner at PF Changs with Debs, Oline Cogdill, Margery Flax , Dana Cameron and others. I was thinking about a question that somebody asked me in a private email. With all these ebooks flooding the market, who will be the gatekeepers, helping readers wade through all the dreck? The same people who always make those decisions, Mark Coker of Smashwords said -- the readers Readers are very unforgiving of bad work, he said, and through Darwinian forces, writers who produce crap will disappear. Your mouth to God's ears, Mark. Hi, Shel! IPads rock! I do remember meeting you in IL. First time I ever autographed an electronic device! LOL. Marcia, re: what Mark Coker said - I believe he's spot on. The reason why is that if you hang out at the Mobile Read forums for any amount of time, you see scads of complaints about poor writing, poor formatting, poor *pick your problem* ebooks. Those people know what they like and what is quality and they won't settle. I have to admit I'm not a fan of delayed ebook release. This is the first time in my life I have been able to get new books on release days (I've always lived in rural areas with no bookstores and I hate mail order), so I don't want to give that up.